Quality film and camera equipment which is fast, moveable and reliable is really important to us. That’s why when we arrive on site, we bring a lot of good quality gear. In additional to our kit, we are more than happy to work with production companies required gear for specific shoots, please don’t hesitate to ask us. We were one of the first few to own a Freefly Alta in New Zealand. After much research, the Alta 6 was our UAV of choice due to it’s portability, the ability to fly the camera both underneath and on top of the machine and a payload of 6.8kg – not to mention being able to so easily unclip our ground kit and attach it to the drone! We spent a lot of our time filming around and from aircraft including aeroplanes and helicopters. Our stabilised 3-axis camera gimbal ensure smooth, bump-free filming in the air. With most of our work it’s important to be able to move and react quickly to get ‘the shot’. The Sony FS5 is our main filming camera with either Sony or Canon professional lenses. Our unique position is the ability to utilize the exact same camera set up both on the ground and when filming in the air, for perfectly matched footage across your production. Combined with the Atomos Shogun Inferno we are able to capture stunning 4k and slow motion footage on the run. 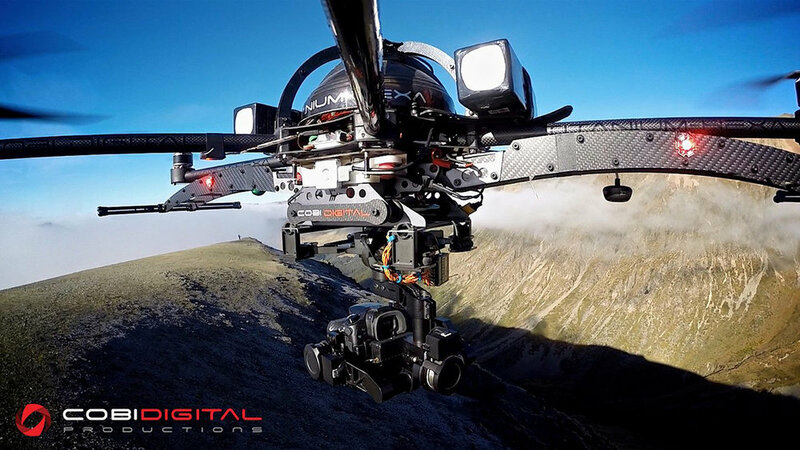 Our two Movi (M5 and M15) systems provide us with stabilised gimbal options for the most smooth imagery on the ground (by hand, on our camera car, by ground vehicle or air wheel) and in the air (on our drone or from an aircraft). Our whole system un-clips and connects to all of our gear for a seamless transition between shooting styles. In addition to our Mercedes van which we can utilise to film from either or the back, we also have a one metre long camera car. With vibration isolation and a speed of up to 90km per hour, capturing imagery just two feet off the ground on a variety of surfaces gives a whole new perspective. We also have an air wheel in our box of tricks. This allows our cameraman to glide along with the camera anywhere from three to seven feet off the ground. Photography is where we began! With two professional photographers, we bring some serious gear to our shoots. We use Canon and Sigma Art professional camera equipment for corporate photography shoots - mobile studio, product photography, staff profiles, architecture, agriculture, experiences, events and more. We do all of our post production in-house, this way we guarantee from concept through to final production, you are receiving the product you want. We Use professional Mac computers, Final Cut Pro and Adobe CC.